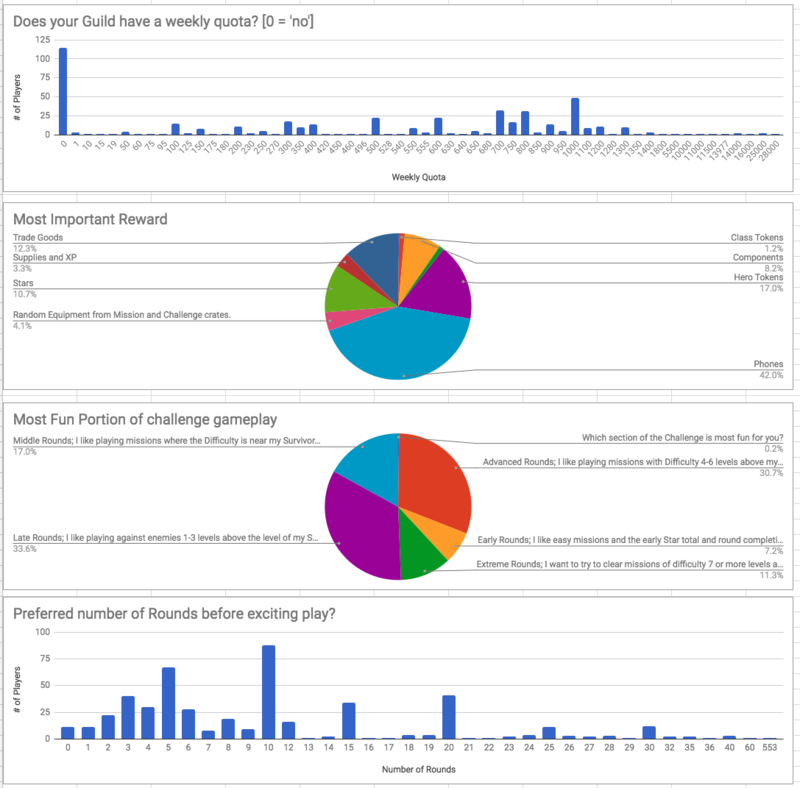 About a month ago, I asked for challenge players to give us some data about their experiences, goals, and preferences regarding the Challenges. 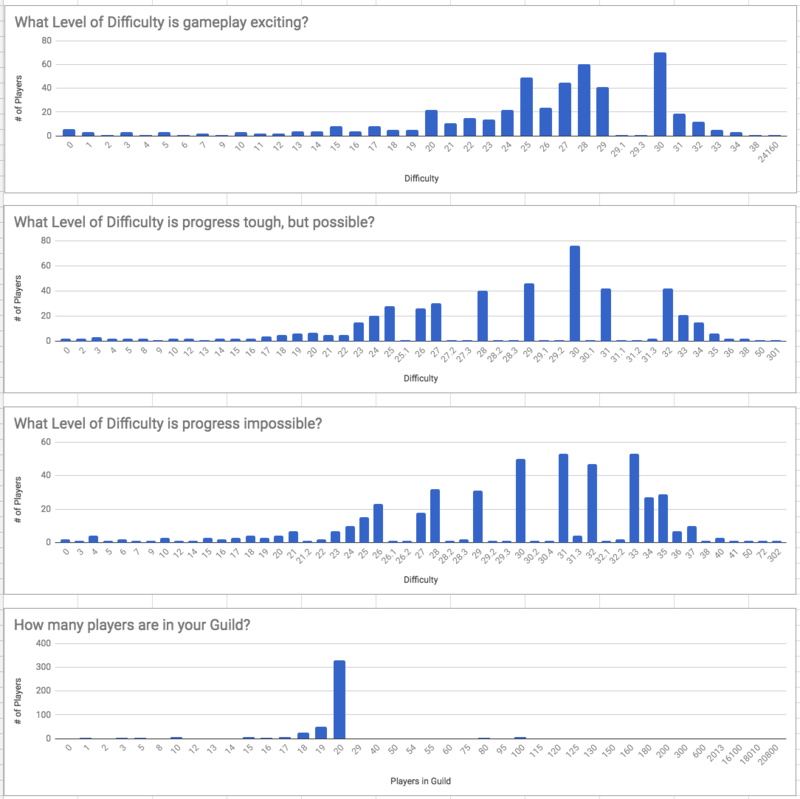 I know some people here like crunching data just like we do here in the office, so I thought I'd share the raw response data for the number-based questions. * As expected, almost all responders were max-level. We got right around 500 responses altogether. * [Side note] Some had asked why we didn't announce the survey in the in-game news. The short answer is that we most wanted data about how veterans play the game, and especially those that play at some of the highest difficulties. We were confident that keeping the survey discussion on social media and the forums would do that, and it looks like we were largely correct. * We are taking the questions on # of Rounds Completed" and "# of Elite Survivors" to be mostly the "Best Guess" kind of response. But thanks to anyone who did go in and look up the info from in the game! * Here, we see that the responding population has progressed very far in the game, and are very dedicated to challenge play. Many of you have regular goals to play a round number of challenge rounds every week. 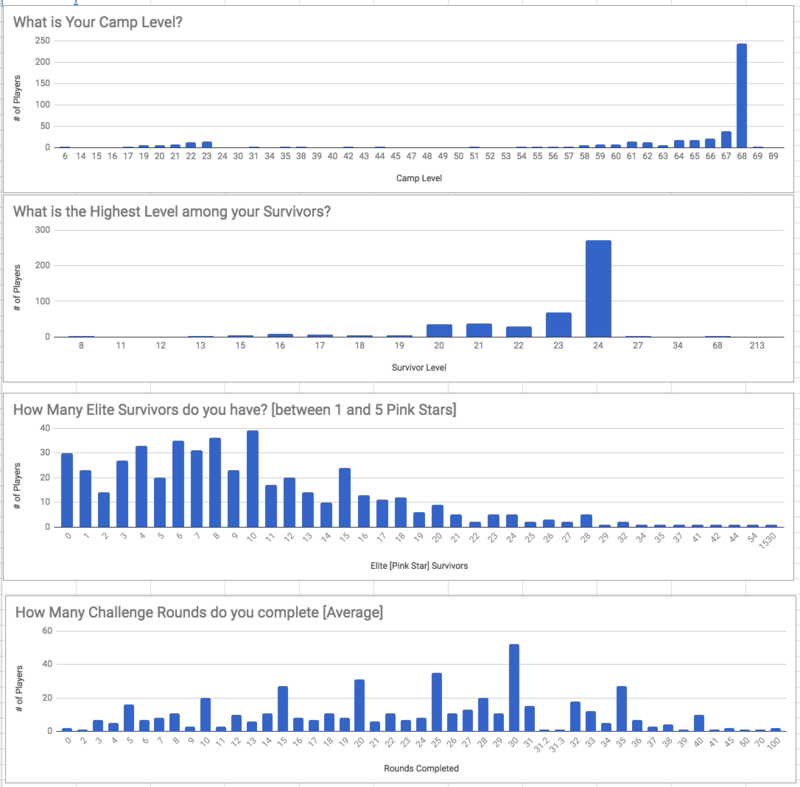 * There appears to still be some confusion between survivor level and camp level, and I doubt anyone has 1530 Elite survivors. Maybe they meant "between 15 and 30?". * Difficulty 30 used to be the 'ceiling' in the game, and it seems to still have a significance in the minds of players. Of course, with level 24 Elite characters, this is about where you will see near-constant Body Shots. * It's telling that the "Tough, but possible" and 'exciting' data are so similar. This was a result I was thinking we might see, and it is pretty well seen in the data. * There is also a lot of overlap between 'tough' and 'impossible'. This is where stars, skill, badges, and other factors show. This is also where it starts to make it difficult to please everyone with a consistent system, since one player's 'fun' might be another's 'frustrating'. * Most players are in full guilds at this level. This is great! I think many put in larger numbers to reflect their larger guild family, which is stellar. If you are the person in the 20800 member guild, please talk to our server team. They wanna know how you did that. * By far, most layers report no quota for their guilds, which was surprising to me. However, in a system where players are rearranged based on commitment weekly [as in many guld families], this makes some sense. * As expected, Phones and Hero Tokens are the most coveted rewards. * Matching the difficulty questions above, players in this group overwhelmingly enjoy "punching above their weight", to use a boxing term. * Most players who responded don't want to play more than 10 rounds before getting to the "good stuff". Respecting, of course, that individual player's definition of the "good stuff". * In a slight surprise to me, we see that 10 rounds is also about how many rounds of "Good stuff" players want to play. I had personally expected the average here to be higher. Shout out to the player looking for 1000 rounds of Challenge. 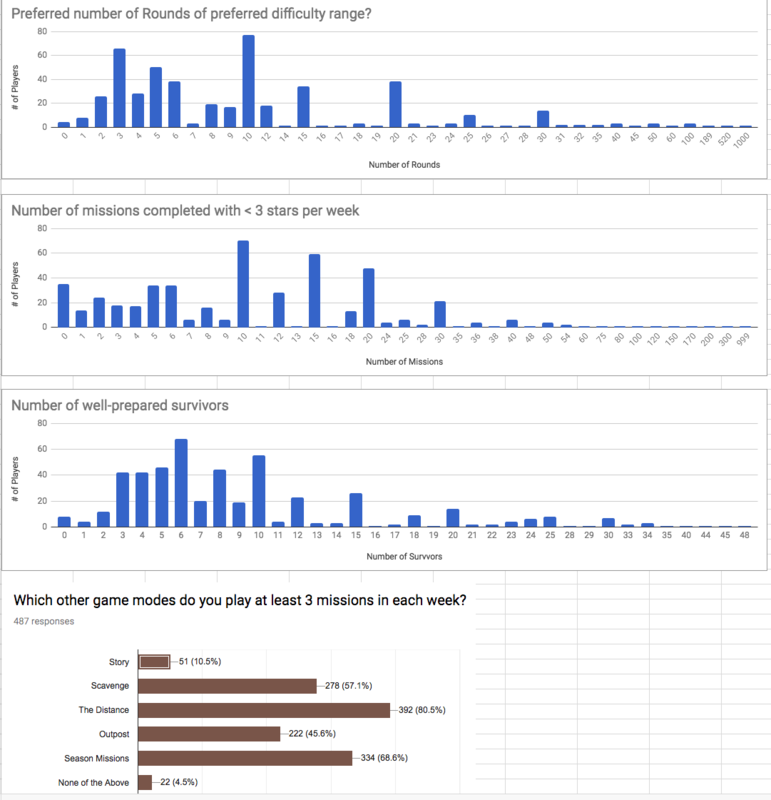 * Players report an average of between 10 and 20 missions per week completed with less-than-perfect results. This shows that they are playing 2-3 rounds where the can only get by with 1 or 2 stars each. * Everyone's definition of a "well-prepared" survivor will be different, but the answer is about what we anticipated. 2-3 "A-team" survivors and lots of hopefuls and heroes waiting in the wings. * We would expect to see the Story completed for most of this group, and the Outpost number is very very high compared to the overall game population. There's a lot more Scavenging going on here than I thought, as well. So, what are we going to do with all this data? In the short term, this information will help us plan if and how we adjust the normal challenge settings for the game. I have seen lots of positive feedback regarding the change to Round Passes [collecting one per 3 rounds completed], and for now, this may be all the change we need. "Don't fix what ain't broken" and all. In the longer term, we may have the opportunity to go deeper with the Challenge before the end of the year [we plan out pretty far on the NML team], and so this will help us find out how to get the system even more into a position where players can see the kinds of progression they want in the Challenge. I think I would be happy if we can find a system that allows players to play less than 10 rounds of warm-up, and then up to 20 more rounds before things get too hard to go on. Ideally, rewards would increase a bit more to compensate for the extreme difficulties. However, if we make everything custom to each individual player, it will be very hard for players to discuss their experiences in a meaningful way. There will be more evaluation of the other survey questions ["reduce the grind" and "better rewards, please!" are two common responses in the open question], and we will probably keep this data to ourselves. Players were not asked if they would allow us to share their responses, so we must assume that all of the info given was for NG's eyes only. There is a lot to think about, but we have better info about what veteran players want than ever before. If you filled out the survey, participated in the conversation, or are just playing the Challenges, thank you! We will do our best to make you proud and hope you are excited to see what is coming next. Thanks for sharing @Shteevie really appreciate it. I see a bright future ahead and things have started to improve in the last months. I see the community is happier, more engaged and hyped. Don't take this is as sarcasm, but the improvements started happening since you started listening to the players and simply doing what they wanted or asked for. Once you (NG) stopped being conservative to changes and started caring more about your loyal customer base. Bringing @Kaz to the forums was one of the smartest moves. Hey! NG! Leave those round passes alone! Seriously they are real good, made my nml gaming spirit refreshed. Yes very happy with round passes tyvm! Who the hell has level 68 survivors?? @Movado, I'm looking at you!!! Thanks for the sharing the results, as well as adding some commentary and quips. The last few weeks are some of the most fun weeks I can remember (other than when I first started) because of the special events, round passes, different types of class/survivor bonuses, lack of fear of a Council upgrade, and more. Because of this, I bought more boosters and bundles in the last few weeks than I have since the beginning of the year. Bringing @Kaz to the forums was one of the smartest moves. Agree. It can't be a coincidence that player voices started getting heard and ideas implemented just after @Kaz joined the forum. Thanks for sharing results! I love the 3 rounds per pass. I’m almost finished in 3 days. Allows me to focus on Sat. Distance and not hurt my guild numbers.